did i mention anythink about Dr Beverly crusher i mentioned wesly crusher the helmsman for the Enterprise-D can you read English properly? I think Oblivion understood you, but just thought that in his own personal opinion it would be cooler to have Beverly as a hero than Wesley as a part of the Ent-E crew again in the mod. oblivion ur the most annoying person ever asking questions about future tense when theres foroums that can provide you with information about future tenese as like myself i have read stuff about future tense in the foroums and seen the awseme videos of future tenese personaly Nobody shoudlnt realy ask the list of question like you did unless they have ideas for the mod now with Regards to Wesly crusher i cud agree with Doci7 why not have the mother and son aboard the Enterprise E or the Dr Crusher's ship? 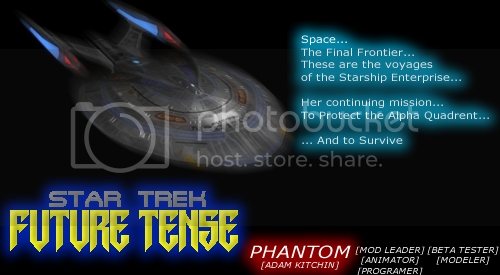 If the pair of you are going to rant then leave the Future Tense forum as far as im concerned you're both as bad as each other, and I'll reference to a previous post, whats Wesley Crusher got to do with the Borg?